Director Georgia Brown took on the challenge of Caryl Churchill’s Love and Information. This was no ordinary task because the play is unconventional to say the least; rather than following a narrative arc with a set group of named characters, the play is comprised of completely unrelated short scenes, some only seconds long which are cut off halfway through a sentence. Additionally, in the script, lines are not assigned to any characters and no context is given for the scenes, leaving this decision to the director and meaning every production of the play is drastically different. For this reason, the play was an ensemble piece with performers Joseph Conway Patience Kanjira, Christopher Stoops, Harry Newman-Walley, Noah Matthews, and Katie Marriott. 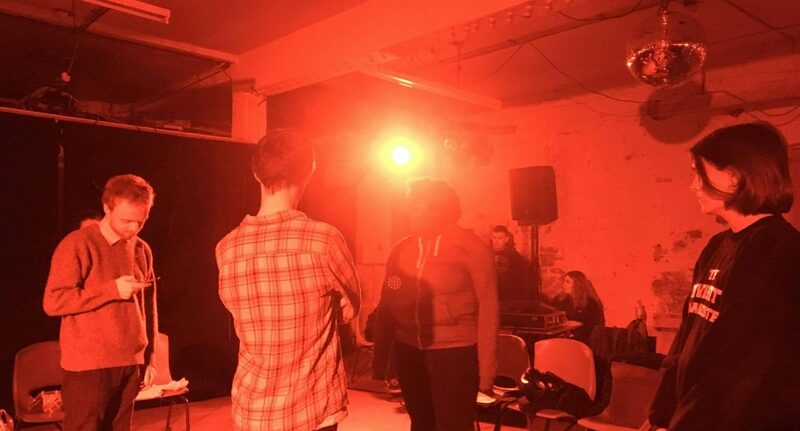 Performed at the Partisan Collective, the episodic scenes meant that the tone jumped from funny to devastating to plain bonkers in a matter of minutes. On paper, this is not a play for everyone, but everyone must appreciate the pure imagination and creativity Brown utilised to bring this script to life. One instance where this was evident was in a scene between Matthews and Newman-Walley. In the script, this is a strange debate about irrational numbers, Brown reimagined it as a conversation between two drunk men in a bathroom, ending with Matthews standing on top of the toilet and peering over the cubicle wall. This was a brilliant way of bringing to life an odd piece of dialogue, all of us have had completely random conversations while drunk. A far more sinister example was the scene entitled ‘Piano.’ In this scene, a man is being introduced to someone named Jennifer and then being told he can play a piano sitting before him. However, for this scene, Stoops and ‘Jennifer’ (Marriott) had their hands behind their back and Stoops was angrily commanded by Newman-Walley to play the piano. With this came the startling revelation that these were prisoners. What could have been a light-hearted scene became horrifying, making music an instrument of torture. I enjoyed the moments of ensemble work the most. Before the scenes even began, the actors silently entered the stage and froze in various intimate poses with one another, before weaving their way around each other in a movement sequence. The lighting design stood out here, using floodlights in beautiful, bold colours that rapidly changed colour. I found the stand-out performance to be from Stoops who displayed extreme charisma and energy. This showed particularly in one scene where he played a rowdy child being told a bedtime story. His posture and use of gesture left the audience in no doubt that he was a young child, especially his forward rolls on the stone floor – which must have been uncomfortable. Kanjira also deserves praise for her monologue about the colour red. Her speech was rapid-fire and appropriately manic, all while maintaining a connection with the audience. It is also worth noting that during her monologue, all the male actors were hopping up and down in unison to heighten the tension of the scene. This showed how much energy every actor had to put in to the performance. Whilst I really enjoyed how Brown translated this text to the stage, I thought more could have been done to distinguish the roles the actors played. It was clear whenever they were playing children, as well as there being one scene where three of the actors were clearly portraying dogs, but I would have liked to see greater differences in voice and posture whenever the actors played different adults. At one point, Marriott put on a West Country accent to play a woman rather optimistically discussing an earthquake which I really enjoyed, but I would have liked to see more instances of this from all the actors. Altogether, I was greatly impressed how creatively Brown such a vague text to life, a greater challenge than the majority of plays.